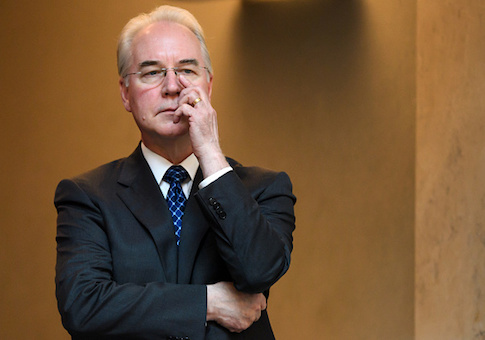 Price, who was previously a five-term congressman from Georgia, was one of the top Trump administration officials who pushed for the repeal and replace of Obamacare. Price was met with boos as he approached the mound to throw out the ceremonial first pitch at Nationals Park in Washington, D.C., according to those who were at the game. Washington Post reporter Jorge Castill sent out a tweet noting the boos. Tom Price, the Secretary of the Department of Health & Human Services, threw out the 1st pitch. He was booed. Others on social media also noted the unwelcoming baseball crowd. Tom Price, the head of HHS, just threw out the first pitch at Nats Park. He wasn't greeted warmly. A former senior adviser to President Barack Obama, Dan Pfeiffer, said whoever's idea it was to have Price throw the first pitch should be fired. The Nationals won 10-1 against the Miami Marlins. This entry was posted in Culture and tagged Tom Price, Washington. Bookmark the permalink.